TREC HARD MASS is a supplement supporting muscle mass designed for people with slow metabolism. 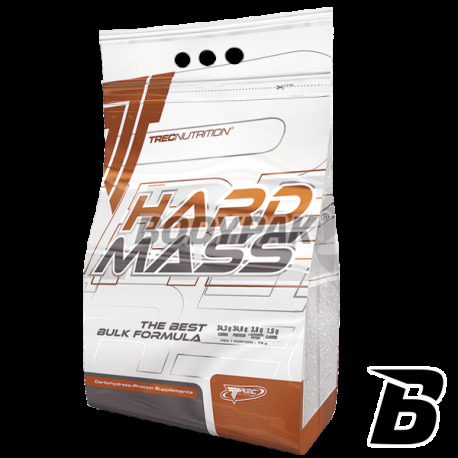 HARD MASS is an optimum combination of full value animal proteins and complex carbohydrates, enhanced with the addition of a large L-glutamine peptide and HMB. These components prevent the reduction of proteins and protect muscle tissue from degradation by stimulating its growth and full recovery. Hard Mass assisted by muscle mass, without the risk of accumulation of excessive body fat. TREC HARD MASS is a nutritional product of muscle mass a "BULK", in which the ratio of protein to carbohydrates is 50%: 50%. Hard Mass is recommended for people with slow metabolism, which can successfully be used to build up muscles without the risk of accumulating fat, as is often the case when using typical carbohydrate-protein called. "Gainerów". In each serving TREC HARD MASS deliver 30 grams of the highest quality instant protein premix consisting of: whey protein concentrate, egg albumen, calcium caseinate. The product has been further enriched with glutamine (taking the form of the best assimilable l-glutamine peptide), which is the most important amino acid for building muscles. Glutamine also exhibits activity of increasing the secretion of natural growth hormone (GH), which significantly accelerates the recovery after intense training. However, what makes Hard Mass a unique nutritional product is a high concentration of anti-catabolic component, which is the HMB (B-hydroxy-B-methylbutyrate). HMB contained in TREC HARD MASS against the destruction of muscle tissue during intense workouts, minimizes the reduction of protein and helps rebuild muscle tissue causing permanent increase muscle mass and strength. Daily demand for this component (3g), only two servings of Hard Mass. This combination of ingredients anabolic (supporting the rebuilding of muscle cells) and catabolic (muscle protecting cells from damage) allows you to quickly increase muscle mass, while minimizing the risk of fat redistribution. 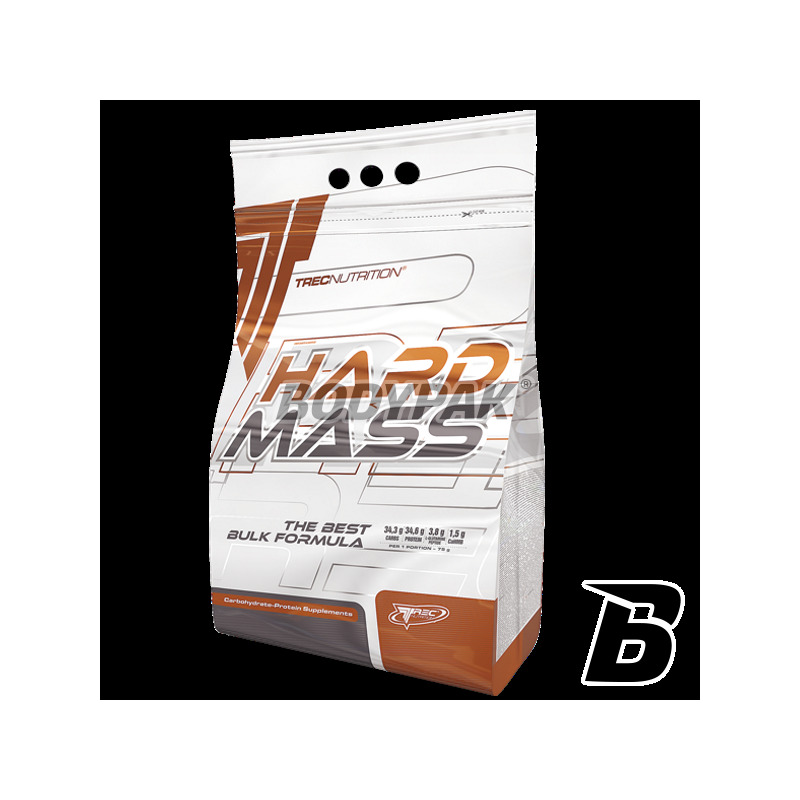 Hard Mass was developed in order to help all athletes to quickly and effectively gain top quality muscles. TREC HARD MASS belongs to the group of foodstuffs meet the expenditure of intense muscular effort, especially sportsmen. TREC HARD MASS - AND you NEVER WILL FEEL THE POOR! The serving of the product - 75 g (3,5 scoops) in 200 ml of water or milk, using a shaker or blender. Depending on your needs, take 1-2 servings daily. Serving 60 min. before the workout, the second serving 30 minutes. after training. serving in the morning after waking up, one portion between meals. Składniki: HARD PROTEIN Blend [koncentrat białka serwatkowego (z mleka); białko jaja; kazeinian wapnia (z mleka)]; MASSIVE CARB Matrix [maltodekstryny; skrobia modyfikowana (z jęczmienia); fruktoza]; MUSCLE-PRO Formula [peptyd L-glutaminy (z pszenicy); beta-hydroksy beta-metylomaślan wapnia]; kakao w proszku dla smaku czekoladowego; regulator kwasowości dla smaku truskawkowego – kwas cytrynowy; aromaty; kompleks witamin [witamina C (kwas L-askorbinowy); niacyna (nikotynamid); witamina E (octan DL-alfa-tokoferylu); kwas pantotenowy (D-pantotenian wapnia); witamina B6 (chlorowodorek pirydoksyny); witamina B2 (ryboflawina); witamina B1 (monoazotan tiaminy); kwas foliowy (kwas pteroilomonoglutaminowy); biotyna (D-biotyna); witamina B12 (cyjanokobalamina)]; substancje słodzące – sacharynian sodu, cyklaminian sodu; barwnik dla smaku waniliowego – beta-karoten; barwnik dla smaku truskawkowego – czerwień koszenilowa. Gainer jeden z lepszych jakich do tej pory próbowałem przyrost masy przy diecie leci szybko w gore w 2 tyg zrobiłem 2kg jest to bardzo dobry wynik,smak vanilia pycha zarówno z wodą jak i z mlekiem oczywiscie z mlekiem lepsze. 5/5 za smak i rozpuszczalność!